Bhante began the evening by taking the first three steps from Ajahn Brahm’s book, “Meditation for Beginners”. Bhante then lightly detailed each of the three steps with a brief and easy to follow instruction. Present moment awareness is the first step. Leaving the past where it belongs, in the past, not thinking of the future because it will probably not happen anyway and so just being in this moment, here and now. Bhante then went on to give examples of the next two steps that we will take as we progress in our practice. Bhante then led us in 3 ten minute meditations. The first one being present moment awareness, no thoughts of the past or the future. The second one being no thought (if we are able). This means that when thoughts arise, we try not to engage with them. Just let them come and let them go, trying to focus on the blank area between thoughts. The third is our traditional meditation where we focus, as best we can, on our breath. We do this by many different methods, some will focus on the sensation caused by the air moving into the nose. Some will focus on the air as it fills their lungs. Don't be afraid to try different methods, find one that best suits you. After the meditation, Bhante opened to Q&A and used a simile for our Do-er and Know-er. Bhante Sangharatana conducts an intermediate / advanced meditation class for approximately one hour. 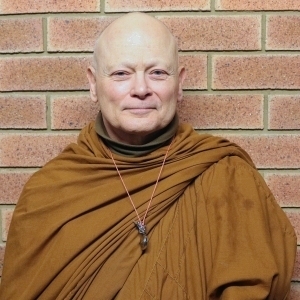 Recorded at Dhammaloka Buddhist Centre, Perth, Western Australia. Bhante began his talk by explaining for our beginners ànàpàna-sati, or mindfulness, on in-and-out-breathing. Mindfulness brings us into the present moment leaving the past in the past, where it belongs, and not worrying about the future. Present moment awareness. Bhante then guided the group in a 30 min meditation well suited to beginners and experienced alike using the breath as our meditation object. After the meditation Bhante opened to Q&A. Bhante then went on to further his explanation of ànàpàna-sati, or mindfulness, on in-and-out-breathing. Bhante also explained the benefits, or rather mind states, that can and often will occur as we progress in our practice. Such as wisdom and there would be few of us that couldn't use a little more of that. Bhante talked to us about letting go. Just as we would automatically pull our hand out of a fire, so to, with consistent practice, will we naturally let go of our thoughts when meditating. Bhante then leads us in a guided breath meditation. First encouraging us to relax our bodies and then guiding us to direct our attention to our breathing, to be aware of it, not change it, just watch it. Bhante's meditation is well suited to beginners and experienced meditators alike. After meditation Bhante opens to Q&A. Bhante then gave a talk on morality, virtue and many of the steps needed by us in order to meditate. Bhante begins with an explanation of present moment awareness. Reminding all of us of those moments we all have in our lives that we can clearly remember in detail. Where we were, who we were with, what was happening at that moment in time. We often reflect to such moments when we hear a song or tune. At the time you first heard the song or tune, you experienced present moment awareness. Bhante explains why we need such awareness to meditate. Bhante then guided the group in a 30min meditation using the breath as our meditation object, or point of focus. Briefly after the meditation, Bhante opened to Q&A before giving us a talk on the things that will hinder [hinderances], our meditation practice. Bhante Sangharatana talked to us about breath meditation, encouraging us to present moment awareness (bringing our attention to the meditation object, or focus on, for example, our breath). Bhante further explained that present moment awareness is of itself not the meditation, but rather the goal. By having, or achieving, present moment awareness we leave the past behind and have no thoughts of the future. We are just here and now, thinking not of the past nor of the future. Bhante then explained for the beginners amongst us [that would be most of us], the need for meditation or why we meditate. He further explained the technique used for a simple but successful breath meditation. He then guided us through a 30 min beginners breath meditation after which he opened the floor to questions and continued the talk.